Pressfolios makes creating an online portfolio for yourself about as simple as it gets. You just give it links to all the stories, designs, photo galleries, videos, etc. that you’ve made, and it puts everything together in an organized and appealing way. I switched to it this spring for my online portfolio. Pressfolios will not physically put the items onto your site. It will just link to them wherever they are in cyberspace, so you’ll need to get all your items on the web somewhere. It’s pretty easy to get things online, but the tips I’ve shared below will give you some ideas and options to use if you aren’t sure how. 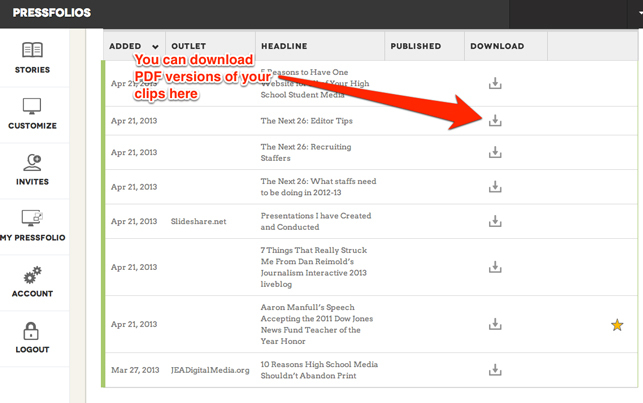 Create an account at Pressfolios.com: If someone who already has an account invites you, you both get more slots. Otherwise, you’ll start with 10 slots. The basics: Customize > Biography > Fill out your information here. You can add your info, social accounts and skills. 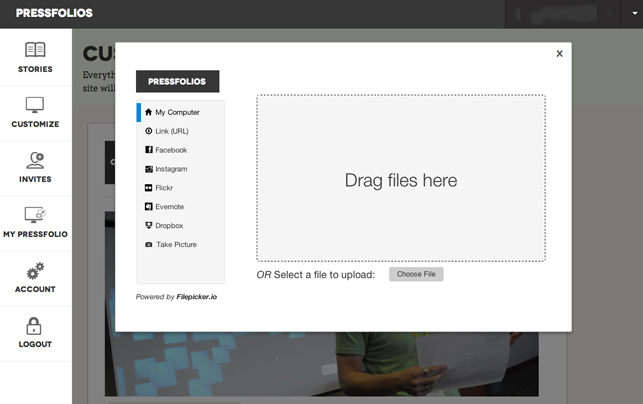 Select some pics: Customize > Images > Choose a wallpaper (it’s like a Facebook cover photo) and a profile image of you. Try to choose clear, sharp images because it will expand the image and you don’t want it to be grainy. You can crop the photos and add whatever effects you want after selecting one. Clips on news sites: All web and newspaper stories, as well as all digital pieces should be on your news website. 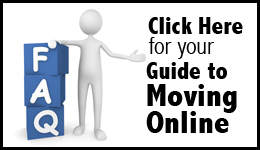 Find the clips on the site you are wanting to showcase and copy the URLs. Picasa, WordPress, etc. : If you have some other kind of account or way to put stuff up on the web, it’ll work as long as you can link to it. 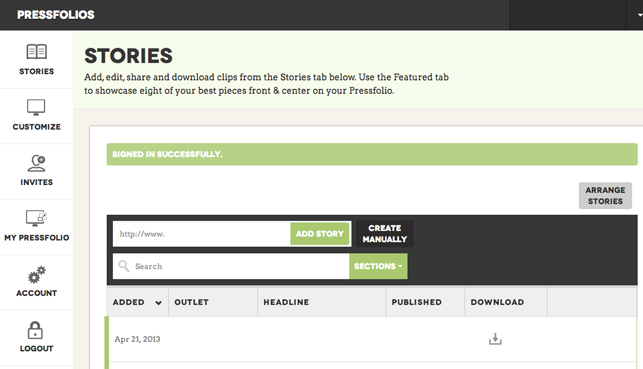 Go to the stories tab: Paste the link to your item into the box and Pressfolios will retrieve it. If you have 9+ items, Pressfolios will randomly choose which 8 to feature first. If you want to choose the featured ones, go to Stories > Featured > add the ones you want featured. You can download some or all of your items under the Stories tab. Now, go to your URL and check it out! There’s not much you can customize on your site (other than your profile and wallpaper) which makes the site simple to use, but this can be a problem for people who want to have a completely unique portfolio. If you’re looking to try it out, the best way is to have someone invite you. That way, you can skip the wait list and both of you will get more spots in addition to the 10 free ones. Editor’s Note: Daniel Bodden is headed into his junior year as part of the Francis Howell North High School journalism program. He will be an editor on the North Star newspaper and contribute to FHNtoday.com as well. You should also have a look at http://photeria.net – you can create your own portfolio website there along with your own domain and it allows you to share your uploads with your friends on facebook.